Wild dragon is a powerful blend of potent herbs and extracts that are known to help support your sexual libido and combat impotence. The natural blend is completely free of side effects and will guarantee you that you don’t need to buy any expensive prescriptions. With Wild dragon you will achieve your sexual confidence again that will keep you going all night long! Wild Dragon gives you the very best in herbal remedies for erectile dysfunction. You should take 1 pill at least 1hr before sexual activity. The results will last up to 2 days. With extreme cases of impotence you may take up to 3 pills, however do not exceed 3 pills within 24hrs. 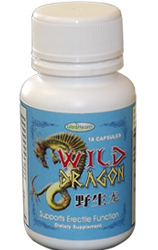 Because Wild Dragon is a 100% natural herbal supplement, the effects can remain in your system for 24 – 48 hrs. Many men report equal or better results on their second night, from just the 1 dose.